USB power board test voltage TECH: Hewlett Packard dv6000 pavilion series of laptop computers have a long standing issue with the power supply jack, also known as the usb power board. 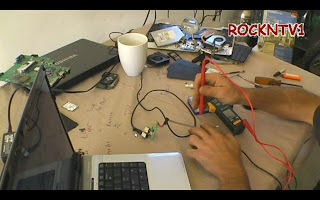 VIDEO, I WILL SHOW YOU HOW TO TEST YOUR USB POWER BOARD. Problems concerning windows error "plugged in not charging" or a complete failure of the laptop to power on are common. The power supply or adapter that plugs into the wall socket are specific to every laptop or notebook and are labelled with their output voltages based on manufacturer specification. These are the voltage numbers you will need to test your computer power supply and usb power board if so equipt. Knowing whether this power jack component is in proper working order may help in diagnosing further computer repair charges. To test the usb power jack you will need a multimeter and follow safety procedure as you must be plugged into the mains 120v or 240v and can be dangerous to personal safety and or other computer components. The USB part of the board is the 5 smaller wires and we will not concern of these for this test, but focus on the 2 pair of red and black wires that direct the power thru the jack connector and board to the smaller connector on the main board of the laptop.